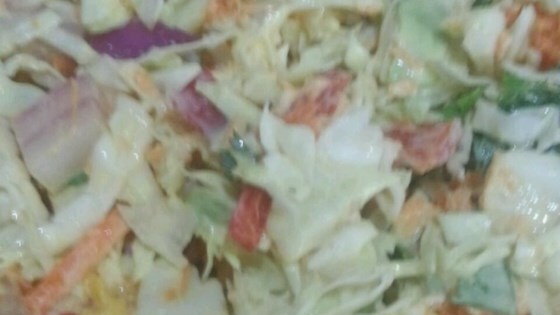 "Colorful, zazzy coleslaw with a Caribbean slant. It's tasty and so pretty! I served this with slow cooker Jamaican jerk pork and it was fantastic." Toss the cabbage, red bell pepper, red onion, carrots, mango, and cilantro together in a large bowl. Whisk the yogurt, mayonnaise, mustard, cider vinegar, agave nectar, salt, pepper, and hot sauce together in a small bowl; pour over the cabbage mixture and toss to coat. Allow the slaw to marinate in the refrigerator for at least 1 hour to allow the flavors to combine. My family did not like this at all. Dry and no flavor other than the cilantro. We really liked this recipe. Thanks for posting.